Christmas is upon us. For many of us it is also the busiest time of the year. Finding the perfect gifts for your loved ones can be bit challenging with so much to chose from. Sometimes not knowing what will work for who could be daunting. While this is a season of giving you must not forget the most important person- you. Whatever the case Ayuspa is here to help. By all means enjoy all the window shopping, stop for coffee and browse the net. 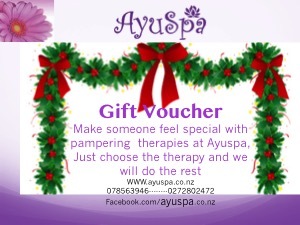 When you have done think of Ayuspa gift card -a gift appreciated by all, never lets you down, works equally well for someone who has everything or someone you do not know very well or whether someone you simply feel like pampering! Whether you’re thinking of your wife, mum, daughter, or someone special, Ayuspa gift card will make her day. It will give her an experience she will never forget. Choose from any of therapy at Ayuspa or combine a few to pamper her. As little or as much- Ayuspa always makes women feel they are special.